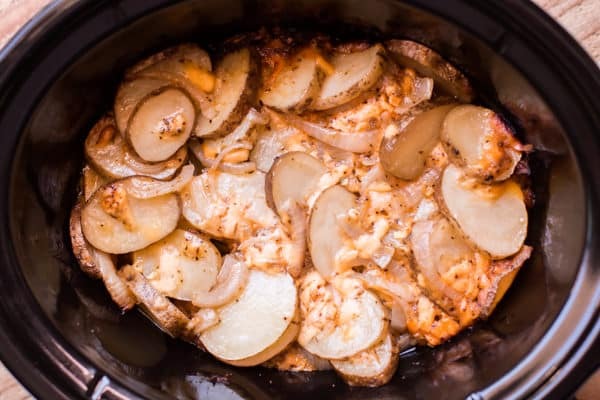 Make these Slow Cooker “Campfire” Potatoes for your next cookout or while camping if you have hook-ups. I haven’t been able to go camping (in our travel trailer) this year. We had some family emergencies and we also just got back from a Carnival Cruise, which took up some of our normal camping dates. 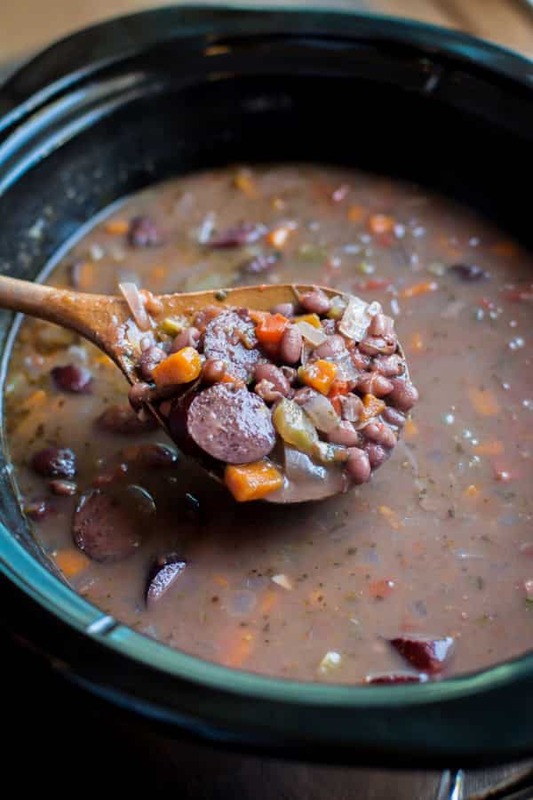 I love making recipes in my slow cooker while camping, instead of grilling or using the fire. 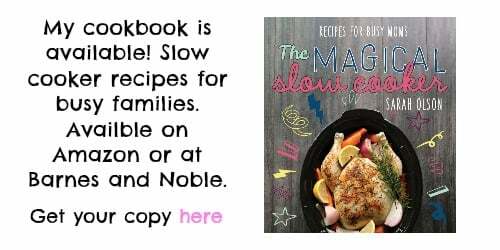 It’s mainly because I know that I’ll get good results and it’s even more joyful for me to cook in the slow cooker when it’s not at home! 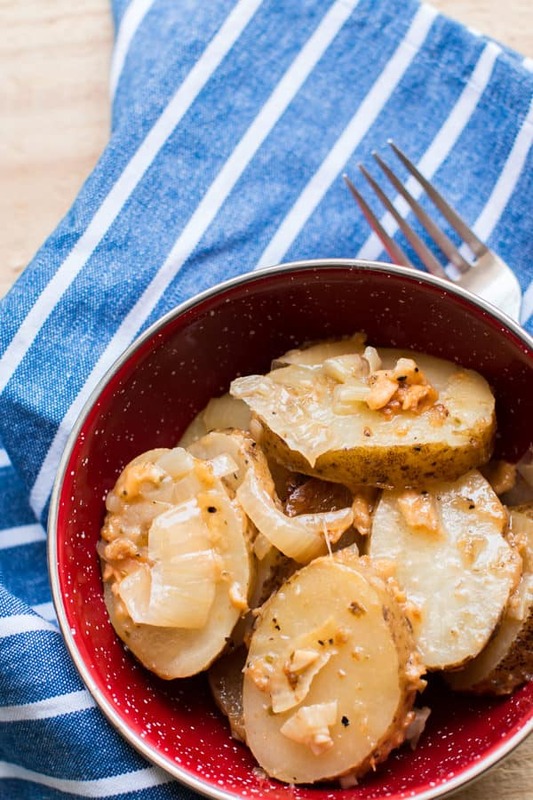 When I started preparing to make these potatoes I planned to make loaded style potatoes, then I came across a few recipes online that use Worcestershire sauce, I added some extra flavors like garlic and parmesan to make these potatoes unique. 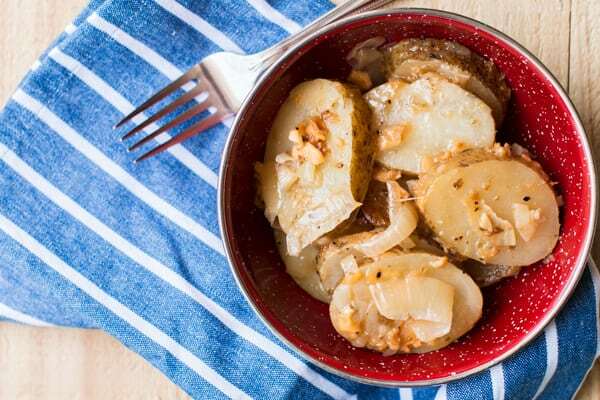 The butter sauce that I make for these potatoes tastes like a homemade dressing. If you are looking for a unique recipe to make, this is a great one to try. After the potatoes are mixed with the butter mixture, it may seem dry. It won’t be I promise, the butter will melt back down and make a delicious sauce for the potatoes. Below is what the potatoes look like after cooking on high for 4 hours. Keep the lid on the entire time so the potatoes get tender. Below is my YouTube video of this recipe, so easy to make! You can follow me on YouTube here. I hope you enjoy this side dish recipe! I’ll be back next week with another new recipe. I’m wishing summer wasn’t flying by so fast so I can make more recipes like this one. 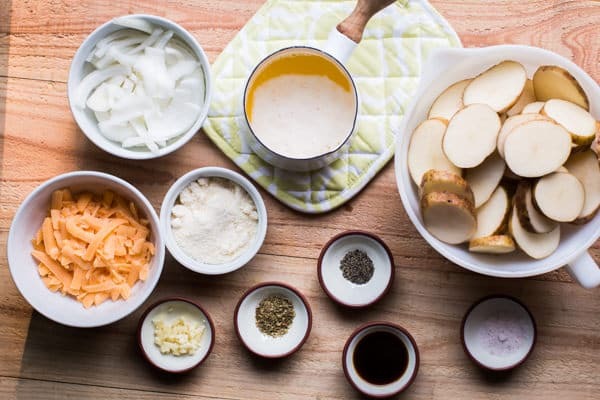 In a large bowl, mix together the butter, Worcestershire sauce, salt, pepper, oregano, and garlic. 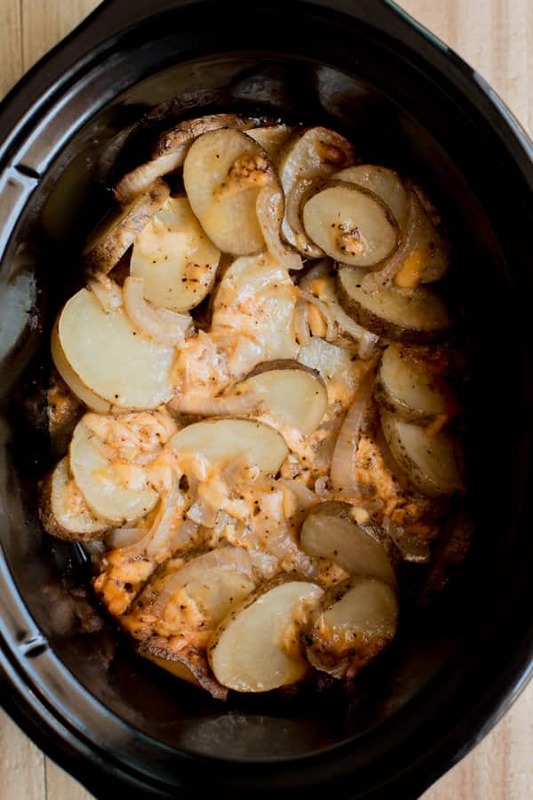 Add the potatoes, the cheeses, and onion to the bowl with the butter mixture. Mix until the potatoes are coated. Spray the slow cooker with non-stick spray. Add the potatoes mixture. Smooth out into an even layer. 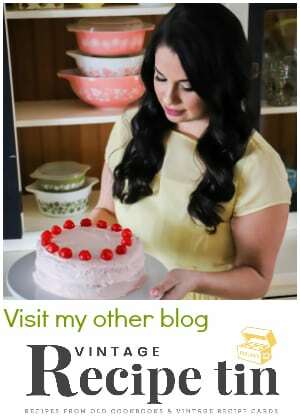 Shared at Whatcha Crockin’ at Farm Wife Cooks. 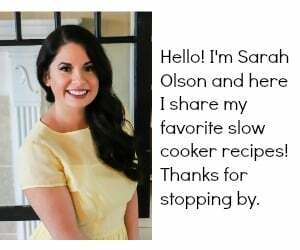 I used my 6-quart Crock-Pot® for this recipe, though any slow cooker 4-quarts or larger will work fine. 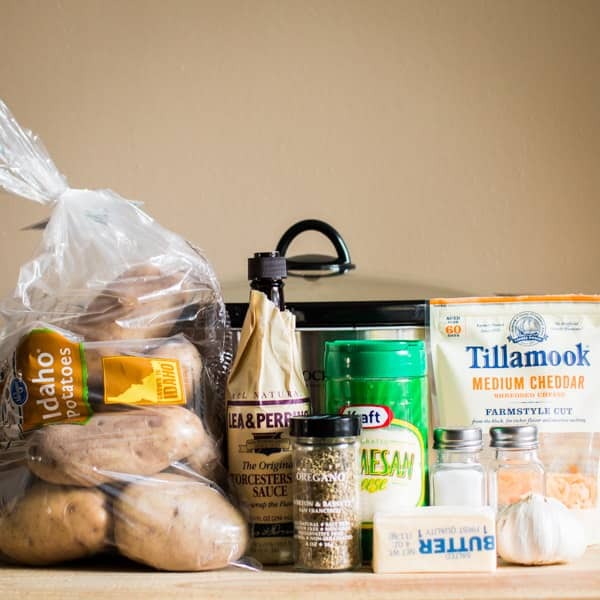 Hi… Wondering if you have ever doubled the campfire potato recipe, or 1 1/2 times?? I think the cooking time will remain the same. Keep the lid on the entire time. I wonder if you can do this recipe with cauliflower as opposed to potatoes? Just maybe not cook it as long. I think this dish makes a great meal with a fresh lettuce salad and maybe some fruit. Was thinking of adding some portabellos. sounds like a perfect meal Mary Ann! Thanks Sarah! This was a great recipe! I made it camping and everyone loved them. I cooked them all day and used one of those liners for the crockpot so cleanup was easy. The worcheshire sauce is the key and adds a perfect kick! Shared this recipe with all my friends. 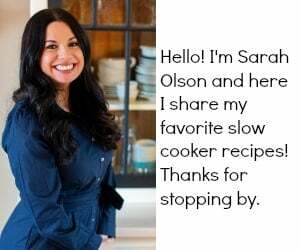 Hi Sarah – since there is only one of me that I cook for when I made this recipe, I took the left overs and placed them in 3 individual freezer bags. Then later I took a bag out and added 2 Tablespoons of milk and reheated it in a microwave bowl for 2 – 2/12 minutes. Yum!!! Thanks for a great recipe. Do you melt the butter first? Making this now going to add some cooked bacon chopped up add a little extra flavor..